The tent that you decide to bring on a thru hike is one of the most important decisions, gear wise, that you will make. This piece of equipment is your home and protects and shields you from the elements after a long day of hiking. Quite literally, this little bit of personal space can make or break a thru hike. 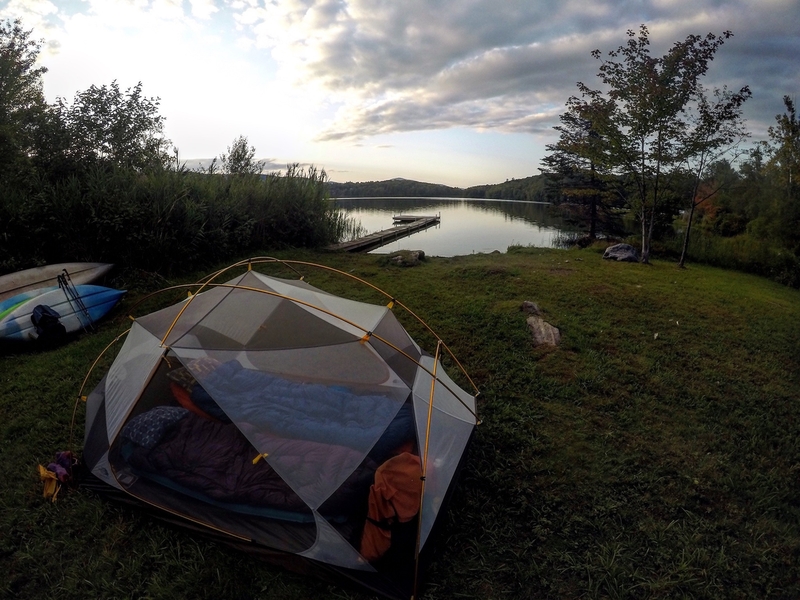 We recieved so many comments and compliments on our tent so this piece of gear was a no-brainer for us to review first. Let’s see some more Triarch’s on the AT in 2018! In the world of long distance backpacking, ultralight gear is king. Less weight = less impact on the body. When we first started researching tents, we started with zero prior knowledge on tents; or really anything for that matter. We didn’t know the difference between a rainfly and a guyline. For those wondering, the rainfly is the protective layer draped over the tent and guylines are the chords on each end that help stabilize the tent. Even with the little knowledge we had, we still managed to pick a tent that drew tons of envy from other hikers. There are plenty of sites out there to get good information on gear reviews. 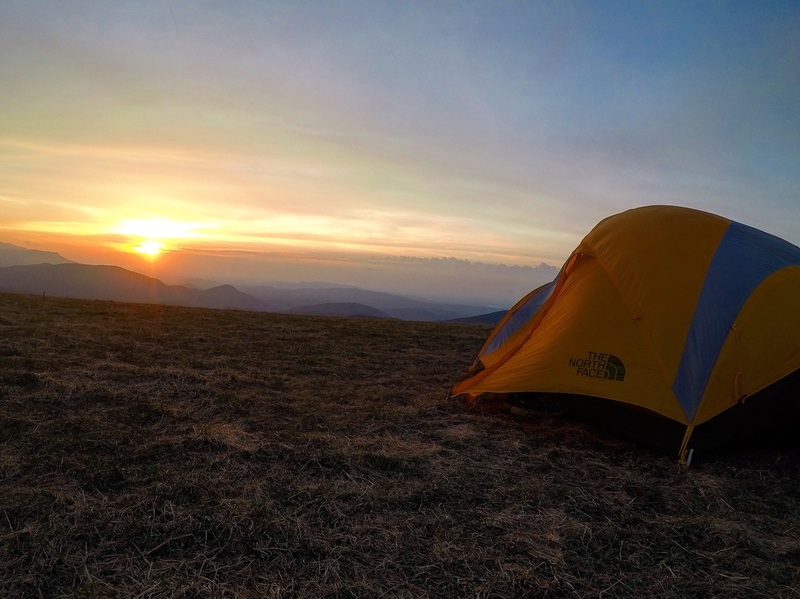 Outdoor Gear Lab has a great article on some of the mainstream backpacking tents. There are also companies such as Zpacks and Hyperlite who make them to order according to custom specifications hikers may have. The tent we decided to go with, the North Face Triarch 3, just ended up being the perfect fit for us. This tent has a lot going for it. This is a 3-person, 3-season tent; or in our case, a luxurious palace for two. The Triarch 3 will make other hikers jealous when they pass by in the morning and they had an uncomfortable night’s sleep. This review is for the 3 person version of this tent, but it also comes in 2 person and 1 person form, which is great for groups of all sizes! Additionally, the way this tent is designed with vertical walls is theoretically speaking rain will not seep in while you’re trying to enter and it’s raining out. With all of that added luxurious space comes a sacrifice—weight. Some hikers may be turned off when they hear that our tent weighs 4.89 lbs. Compared to other ultralight tents this tent can seem like too much space and weight. Amanda and I split the weight of the tent to share the small burden of a large tent. Amanda carried the poles, stakes, and foot print which weighed a total of 1.88 lbs. I carried the tent and rainfly in a compression sack and that weighed 3.01 lbs. We also found realized that the poles weren’t super durable. We encountered a serious windstorm while camping on Max Patch and found that one of the poles was bent in the morning because of it. This subsequently made the rainfly not fit and we had to exchange it for a new one. That was probably the highest wind speeds we experienced on our entire hike so the probability of camping in such wind speeds isn’t that probable; but anything can happen in the woods. Bottom line, this tent has some serious room to it. It is basically four feet tall and has all of the headroom that we could ever need. There was one part of our hike where we had five total people sitting in a circle with room to spare. What we were doing in that circle is not important. It is long enough to sleep a 7′ giant and wide enough to fit two large sleeping pads. 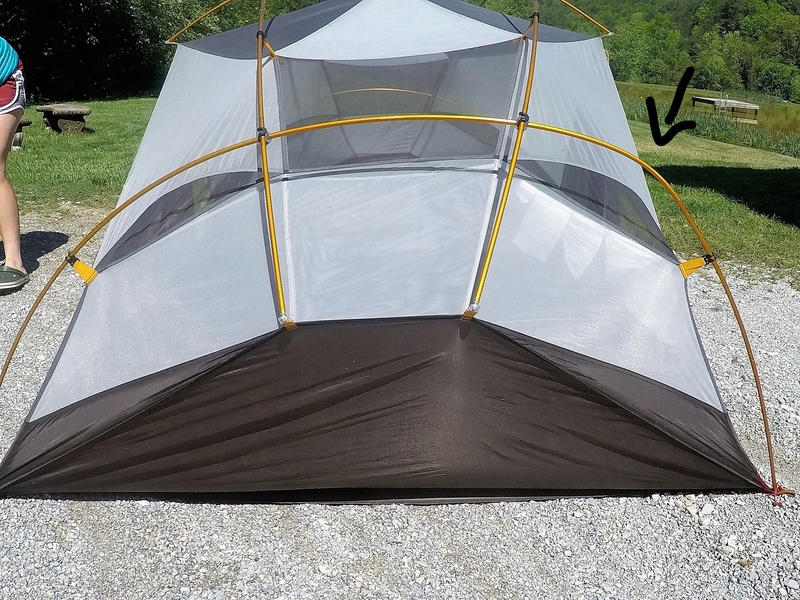 This tent is perfect for hikers who want a little extra space at night! We have also found that North Face has exceptional customer service. When one of our poles bent in a windstorm on top of Max Patch, our rainfly didn’t quite fit and North Face didn’t hesitate to overnight us a brand new one with postage paid. We have heard similar stories from friends on the trail and some of the other big name tent companies don’t stand behind their gear. Some companies will only partially replace broken equipment while others make the customer pay for the broken part and to ship it, with no expedited shipping options available. After numerous talks with older hikers, they all said that North Face was the go-to tent company before these new companies came to be. Regardless, we could not have been happier with our home on the Appalachian Trail. Thank you again, North Face! Im glad the North Face provided great customer service. I have had lots of their products before and they are very well made. I heard some customer service horror stories about other very popular tent companies and I am glad you guys didn’t have to deal with on your hike! This tent seems like it would work well for a couple with plenty of space. It seems the number of people plus one is a great tent rule even for thru hikes. Just got a Triarch 2 myself. Sadly, all the poles were weirdly bent right out of the bag. Now that I’m looking, nearly every review shows photos of similar poor quality poles with bends! My 25 year-old/well-abused lightweight Sierra Designs tent doesn’t have bent poles like this new one’s. Good to hear they came through for you. I’m SO hoping North Face does the right thing with mine. I’ve heard some real horror stories lately. This tent seems very similar in size and weight to the REI Half Dome. 4.89 lbs. Floor Area: 39.7 square feet vsw 38.1 square feet and 5 lbs. (the Half Dome 2+) or 4 lbs. 9 oz and 31.8 square feet for the Half Dome. The is currently on sale for $129, the other is on close out. I ended up with a 39 sp ft / 3.6 sq m Mountain Hardware Ghost UL3 for my wife and I. At 3 lb 2 oz it is a good deal lighter. Wish you the best with your tent. The UL3 goes on sale for $279 from time to time. The North Face Triarch 3 at $470 (though I wonder what the discounts look like) seems heavier and kind of pricy.